Drug discrimination can be described as a "drug detection" procedure that uses a pharmacologically active agent as the subjective stimulus. Although the procedure does require some effort to implement, it can be an extremely important tool for understanding drug action. Whereas medicinal chemists should come to learn the types of information that drug discrimination studies can offer, pharmacologists and psychologists might come to realize how medicinal chemists can apply the types of information that the paradigm routinely provides. Drug Discrimination: Applications to Medicinal Chemistry and Drug Studies provides in-depth analyses of the nature and use of drugs as discriminative stimuli and bridges some of the numerous gaps between medicinal chemistry, pharmacology, and psychology. Stressing the practical aspects of drug discrimination, including types of procedures, study design, data, and interpretation, the book details the advantages and limitations of drug discrimination studies versus other pharmacologic evaluations. Practical information from leading researchers in the field addresses specific topics and techniques that are of interest in drug discovery, evaluation, and development. 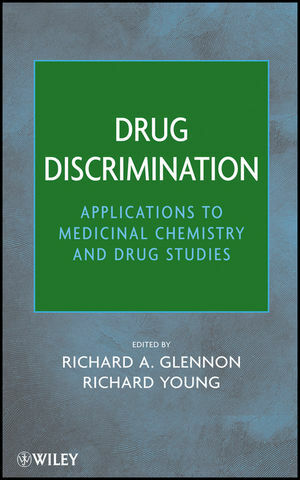 A groundbreaking new guide to the applications of drug discrimination studies for medicinal chemistry and neuroscience, Drug Discrimination is essential for any scientist, researcher, or student whose interests involve the design, development, and/or action of drugs acting at the level of the central nervous system. Richard Glennon is Chair of the Department of Medicinal Chemistry at Virginia Commonwealth University. He is the author of over four hundred scientific publications and book chapters. Richard Young is an Associate Professor in the Department of Medicinal Chemistry at Virginia Commonwealth University. Previously, he worked in the pharmaceutical industry at Ayerst and A. H. Robins (both now Pfizer).